Ladies and gentlemen, we’re gathered here today to give thanks for the life of Cpl. Nathan Cirillo, struck down last week in the service of his country. His country, our country, our Canada. Ever desiring peace, Canada has been built upon the noblest ideals: freedom, democracy, human rights, and the rule of law. And for as long as these ideals have been the foundation of our country, it has been the men and women in uniform who have been, in the end, their ultimate guardians. Sometimes, they have given their lives in that service . . . And last Wednesday, Crp. Cirillo became the latest to do so. Cpl. Cirillo was a member of one of Canada’s great regiments, the Argyll and Sutherland Highlanders of Canada (Princess Louise’s). In more than a century of service, with honours earned from the Somme to Afghanistan, this regiment’s record of courage under fire is as distinctive as their kilt . . . To quote Captain Sam Chapman, who served with the regiment during the Second World War, it is a history written in blood. Now sadly, Cpl. Cirillo has added another page to that great narrative of devotion unto death. In a bitter and truly heart-wrenching irony, he did so as he guarded Canada’s national place of solemn, sacred remembrance. Canadians come together at our National War Memorial and the Tomb of the Unknown Soldier beside to honour those who have given their lives for our country. As Canadians we stand there humbled, and grateful . . . These monuments remind us that freedom is never free. It has been earned by the soldier and then donated to all of us. most of us can never truly the understand the significance to a soldier of the simple act of standing reverently on guard at that place. But those chosen for this sought-after assignment, this vigil of the National War Memorial and over the unknown soldier’s grave, they understand. Cpl. Cirillo, who felt the calling of a soldier when he was just a 13-year-old cadet, he understood. He knew what he was protecting and what he was preserving. He died protecting and preserving. And I’m pleased to know that only after a brief interruption, on Friday past, the honour guard at that sacred place officially resumed its duties. For Canadians, the memory of Cpl. Nathan Cirillo will now be forever linked to that place. Just as the crowds that gathered there to honour the returning . . . mirrored those who gathered along the Highway of Heroes later that same day to bear witness to Cpl. Cirillo’s final journey home. He has now joined the ranks of so many Canadians who have gone before him, having given all in the service of their country. Our hearts are broken at his loss. But our spirits are grateful for his memory. Cpl. Cirillo knew what all those men and women before him also knew . . . The only values really worth living for are those worth dying for. So may God bless Cpl. Nathan Cirillo. We are better for his life, and we are diminished by his loss. And I know Canadians everywhere join me in praying for Cpl. Cirillo’s family. His mother Katherine, his father Victor, his sisters Nicole and Natasha, their partners Richard and Jonathan, his nephew Cameron, as they shoulder this terrible burden of grief. May time ease the searing pain of today. And may his son, young Marcus Daniel Cirillo, someday find comfort in the fact that our entire country looks up to his dad with pride, with gratitude, with deep abiding respect. As Canadians, we will persevere, taking strength from the legacy of service of Crp. Cirillo, and giving thanks all the more for the courage and dedication of all the women of the Canadian Armed Forces. May God bless them all, and may God keep our land glorious and free. Cpl. Nathan Cirillo was shot and killed as he stood guard at the National War Memorial in Ottawa on Wednesday. We want to provide an update on certain aspects of the terrible events that unfolded yesterday in downtown Ottawa and on Parliament Hill. Foremost, I would like to extend condolences on behalf of the Royal Canadian Mounted Police to the friends and family of Corporal Nathan Cirillo. Our sympathies are with our friends in the Canadian Forces, who have tragically lost another member of their family this week to senseless violence. Our thoughts are also with those who sustained injuries in yesterday’s incident, and those who were kept from their loved ones during the tense hours of lock-downs while police searched for other possible suspects. As we all now know, the suspect has been identified as Michael Joseph Zehaf-Bibeau, 32 years old. He is a Canadian citizen, and we have information that he may have had dual Libyan / Canadian citizenship. He was born in Montreal has lived in Calgary and most recently in Vancouver. We were aware that he had applied recently for a passport as we were contacted to conduct background checks. The RCMP did not possess information at that time that would reveal any National Security-related criminality. His criminal records indicated infractions related to drug, violence and other criminal activities. The RCMP also had uncorroborated information suggesting that he had associations with an individual who is known to us. I can confirm that Zehaf-Bibeau was not one of the 90 high risk travelers that the RCMP is currently investigating. According to some accounts, he was an individual who may have held extremist beliefs. We have learned through the current investigation that this individual has been in Ottawa since at least October 2nd, 2014, that he was in town to deal with a passport issue but that he was hoping to leave for Syria. We also learned yesterday that the beige vehicle used by the suspect was purchased on October 21, 2014. There were concerns at the initial stage of the emergency response that there may have been more than one individual involved. Our partners at the Ottawa Police Service and the RCMP agree that yesterday Zehaf-Bibeau acted alone and that he is the same person that perpetrated the attacks at both the National War Memorial and on Parliament Hill. The investigation is ongoing and will rapidly determine if Zehaf-Bibeau received any support in the planning of his attack. We have no information linking the two attacks this week, in St-Jean-sur-le-Richelieu and in Ottawa. Our investigation has not revealed any link between Zehaf-Bibeau and Martin Couture-Rouleau, the individual who perpetrated the attack against member of our Canadian Forces in Quebec. These are difficult threats to detect. There is no way of knowing where or when such an attack could take place. I can provide you with a brief timeline of events as we understand them at this point. Witnesses interviewed by Ottawa Police Services reported seeing the shooter, at around 9:50 coming from behind the War Memorial on the West side where he fires twice at Reservist Nathan Cirillo. The shooter is positioned on an angle behind the victim where they cannot see him coming (as they are facing south). The shooter fires one shot at the second guard, but he missed him. Witnesses heard the suspect yelling something in English and then running towards the north. The investigation revealed that he used the beige vehicle and headed to Wellington. From the National War Memorial the suspect drove North on Wellington Street and parked his vehicle at 9:52:23 in front of the Elgin entrance. He accessed the grounds of Parliament Hill at 9:52:31 on foot and started running toward East Block where MP vehicles were parked. At 9:53:16, video footage shows the suspect overtook one of these vehicles and drove toward Center Block. At 9:53:37, he immobilized the vehicle on the left side of the Peace Tower and started running toward the main doors of Center Block. At that time, RCMP vehicles on site chased the suspect to the entrance of Center Block. The suspect entered Center Block at 9:53:46, seconds before the RCMP officers that were chasing him were able to reach the doors. Once inside Centre Block, the suspect engaged in a fire exchange with the House of Commons Security and RCMP officers. The exact details of this exchange are still under investigation. We need to recognize the courage of all officers involved in this fluid and dangerous situation. There is no longer an immediate threat however we continue to exercise increased vigilance, and are taking extra precautions to ensure that Canadians remain safe across the country. Until we are able to fully review the current threat picture, additional security measures have been taken to increase surveillance of suspected high risk travelers currently under investigation across the country. This is an unsettling event for all of us. Though we are calling on everyone to remain vigilant, I want to stress that you are safe. Your families are safe. It is disheartening and frightening to anyone – police included- when a senseless act of violence takes place in Canada. I would like to acknowledge the response of RCMP members, Parliamentary security and Ottawa Police officers, who rushed into a dangerous and volatile situation. We had a total of 400 resources deployed to Parliament Hill yesterday. This included investigators, intelligence, emergency response teams, technical support, crisis negotiators, incident commanders, tactical troops and more. I realize there will be many questions regarding the RCMP’s role in protecting the Parliamentary Precinct. I can tell you, it is certainly a challenging security environment. We must balance the need to be responsive to potential threats and risks to our Parliamentarians, their staff and the general public, with the freedom to allow for secure and democratic access in and around our institutions of government. I want to close by thanking the public who respected and tolerated the security perimeters established in downtown Ottawa yesterday, along with the many other citizens who patiently waited in lock-down until the scene was secure. There was a large volume of people at the scene of the incident and it took time to process them and ensure their safety. Your cooperation was invaluable to officers who were trying to get a difficult job done under very stressful circumstances. I also want to acknowledge the media who took time to sift through facts in order to provide timely and accurate information to the public. We understand that when such terrible incidents happen, there is an appetite to know as much as possible – as soon as possible. Trust that we want to provide you this information, but we also must respect protocol regarding notification of kin, along with protecting the integrity of the investigation of an incident that was still ongoing at the time. Our investigation continues and is complex in scope. We will be increasing our uniformed presence for the immediate future by adding an additional rapid response capability. Be assured we have the right people working to accomplish the large task at hand. We ask for the public’s continued patience as we continue to investigate this matter. These tragic events underscore how we all must take active measures to ensure we protect that the safety and security of all Canadians. Look out for each other. Remain vigilant, but know that Canada remains strong and free. “Mr. Speaker, I would like to begin today by recognizing and thanking the Leader of the Opposition and the Honourable Member for Papineau for their kind remarks and words of encouragement yesterday evening. “Mr. Speaker, in our system, in our country, we are opponents but we are never enemies. “We are Canadians, one and all. “We may be across the aisle from one another, but when faced with attacks on the country we all love and the things we all stand for, I know we will always stand together. “Mr. Speaker, today more than ever before, I’m quite pleased to see all of my colleagues from all parties in good health and good form. “Let me just maybe use that Mr. Speaker, through you, to provide a little bit of advice to my colleagues. “I think my position and a growing number of grey hairs entitles me to do this once in a while, and that is just to say, we all here are engaged in extremely demanding and stressful jobs. “But the stress that many of you faced yesterday was really beyond and above anything that any of us are really expecting to face. “I would just say while we resume our duties, and I’ll talk about that in a moment, I would encourage everybody here to take care of their health. “Be sure that you find some time to relax in the next little while, and also if any of you – because we are not all in perfect health – if any of you are experiencing any undue physical stress as a result of what occurred yesterday, please take the time to see a physician and get that checked out. “I also just want to say to Canadians – we heard a lot of feedback from Canadians yesterday. “We are all used to the feedback we get very regularly from Canadians. “Much of it in the form of brick bats, and some of it deserved. “But in this case, Mr. Speaker, I think we all experienced the tremendous outpouring of warmth and affection and good wishes from people across the country and we thank them, all of us here. “I just also want to convey all the good wishes that I heard personally, not just from Canadians but from our friends outside the country. “I heard from President Obama, from Prime Minister Abbott, from Prime Minister Netanyahu, through a statement from Prime Minister Cameron. “We’ve heard these expressions across the world. “I think we were all, as Canadians, touched by the wonderful gesture shown last night at the Pittsburgh Penguins hockey game. “So thank you to our friends in the United States and around the world. “Of course, Mr. Speaker, we know all too well this is not a happy day for everybody. “In particular, a terribly sad day for all of the family, loved ones, friends, colleagues of both Nathan Cirillo and Patrice Vincent. “We have seen photos of these lovely men. “We’ve all seen the pictures of these beautiful guys, as Don Cherry would say, and our hearts really are with all of them. “We are so fortunate to have people like this. “The past couple of decades has, you know, we see across the world, increasing places where the planet is descending into savagery and there are people who every day of their lives stand on guard for this country and for all of us, and we obviously want to convey our gratitude to these two servicemen and their families, but also to all the people who undertake this extremely dangerous work. “Mr. Speaker, I spoke of the state of much of the world and I think for all of us who are blessed to live in a country like this, it is hard to appreciate, understand, fathom how we can have people who so despise, are involved in a movement who so want violence, who so despise modernity, who so hate progress, that they can desire to drive out medical workers from their community, harm them, how they can enslave women, torture children. “How they can kill, want to kill anyone who looks or thinks different than them. “It is in a sense, Mr. Speaker, beyond our comprehension but it is very real and in this struggle in which we are engaged, in which not only our finest values must be put to work, so must be and will be the highest unity and resolve. “They are our ultimate and indispensible weapons and that’s what these people will face. “Mr. Speaker, with regard to the events of yesterday and in recent days, a number of questions remain and will all be answered over the course of the police security investigations. “But I can tell the House this today: the objective of both of those attacks was to spread fear and panic in our country and to interrupt the business of government. “Well, Honourable Members, as I said yesterday, Canadians will never be intimidated. “We will be vigilant but we will not run scared. “We will be prudent but we will not panic. “And as for the business of government, well, here we are, in our seats, in our chamber in the very heart of our democracy and our work. “Mr. Speaker, in all its diversity of peoples and opinions, this House personifies the spirit of Canada. “Canada will never yield to terrorism and neither will this House of Commons. “We will attend to the country’s affairs and we will be faithful to the trust that people have placed in us. “Now, Mr. Speaker, as I said earlier and I have been saying for a long time, we live in dangerous world. “Terrorism has been here with us for a while and dangerously close on a number of occasions. “I speak for example, I draw our members’ attention back to incidents such as the Toronto 18, the Via Rail conspiracy in 2013, and I could point to a number of others as well as many that most will never know about. “For that reason and with the belief and security that Canada is the government’s primary responsibility, we have over the years passed such legislation as the Combating Terrorism Act and the Strengthening Canadian Citizenship Act to better protect Canadians and secure institutions. “Last week, our Government proposed amendments to the legislation under which the Canadian Security Intelligence Service operates. “And as you know, Mr. Speaker, in recent weeks I’ve been saying that our laws and police powers need to be strengthened in the area of surveillance, attention and arrest. “They need to be much strengthened and I assure you, Mr. Speaker, that work which is already underway will be expedited. “In conclusion, Mr. Speaker, we’re all aware and deeply troubled that both of this week’s terrorist attacks were carried out by Canadian citizens, by young men born and raised in this peaceful country. “I share this concern, and I have to ask myself what sort of feeble-mindedness could lead a person to reject a nationality that so many people in so many countries would do anything to earn for their children. “That is a question for another day. “For now, make no mistake, even as the brave men and women of our Armed Forces are taking this fight to the terrorists on their own territory, we are equally revolved to fight it here. “We live in dangerous times, yes, but the mission of our country and the work of this Parliament goes on. “And so does the work throughout this city. “Let me just say one final word, in recognizing all of the heroics of yesterday. “First of all, I know so many – I could certainly speak personally to my staff at 24 Sussex – Mr. Roger Charbonneau, the chefs, Tim and Tina, who were up all night. “But I know people who for all of us across the country and here in Ottawa were working day and night to make things as easy as possible. “Officials who were busy at work trying to respond to the situation, first responders and citizens who put themselves in harm’s way when this incident began to unfold. “I am very touched by the attention directed at me following yesterday’s events. However, I have the support of a remarkable security team that is committed to ensuring the safety of Members, employees and visitors to the Hill. Yesterday, during extraordinary circumstances, security personnel demonstrated professionalism and courage. I am grateful and proud to be part of this team. “House of Commons Security Services also maintains a close working relationship with its security partners, including Senate Security, the RCMP and the Ottawa Police. This close collaboration made it possible to pull together and quickly restore order in the Parliamentary Precinct and throughout the downtown core. “I would also like to take this opportunity to thank the Speaker, the Hon. Andrew Scheer, for his leadership and calm demeanour throughout. “On behalf of all members of the House of Commons Security Services team, I would like to extend our deepest condolences to the family of Cpl. Nathan Cirillo. Our prayers are with you. Our thoughts are also with Constable Samearn Son, who has been with the House of Commons Security Services for 10 years. Constable Son suffered a gun shot wound to the leg. He is in stable condition and expected to make a full recovery. “As this is an ongoing investigation, I unfortunately cannot comment any further at this time, nor can any member of my Security Services team. “My fellow Canadians: I’m speaking to you from a Parliament Hill just coming out of lockdown. I am deeply saddened by today’s events here in Ottawa and unreservedly condemn these brutal and heartless acts of violence. This attack in unforgivable, should any other perpetrators or co-conspirators exist, they must be caught and be punished to the full force of our laws. I’ve extended an offer of full support to the government along with assistance members of our party can provide at this time. My thought and prayers, along with those of my colleagues, go out to the family and friends of the victims of today’s horrific shooting, including Cpl. Nathan Frank Cirillo, who was standing dutifully, guarding one of our nation’s most sacred monuments. It was a cowardly act — an unarmed man was murdered in cold blood at close range. Words cannot express the steep sadness we feel over his loss. To the brave women and men who rushed to the scene to confront the shooter and help keep us safe, I can say only thank you. Thank you for your selfless courage and your professionalism in this time of crisis. In the days that follow there will be questions, anger and perhaps confusion. This is natural, but we cannot let this get the better of us. Losing ourselves to fear and speculation is the intention of those that commit these heinous acts. They mean to shake us. We will remain resolved. They want us to forget ourselves. Instead, we will remember. We will remember who we are. We are a proud democracy, a welcoming and peaceful nation and a country of open arms and open hearts. We are a nation of fairness, of justice and the rule of law. We will not be intimidated into changing that. If anything, these are the values and principles to which we must hold on even tighter. Our dedication to democracy and to the institutions we have built is the foundation of our society and a continued belief in both will guide us correctly into the future. Staying true to our values in a time of crisis will make us an example to the world. Criminals cannot and will not dictate to us how we act as a nation, how we govern ourselves, or how we treat each other. They cannot and will not dictate our values and they do not get to decide how we use our shared public spaces. Today, some speak of the loss of innocence in Canada. This is inaccurate. Canada is not and has never been innocent to the threats we face. And we know, as we have always known, that we are not immune. What is true is that we have never let those threats shape us and we have never bowed to those that mean to undermine our values and our way of life. We have remained Canadians and this is how we will carry on. We will get answers to how and why this happened. They will be vital in preventing any future attack. And to our friends and fellow citizens in the Muslim community, Canadians know acts such as these committed in the name of Islam are an aberration of your faith. Mutual respect and admiration will help to prevent the influence of distorted ideological propaganda posing as religion. We will walk forward together, not apart. In the coming days we will be inundated with pictures and videos showing what happened today. But there is one that we should all remember: the picture in our minds of Canadians helping Canadians. That is who we truly are, and that is who we continue to be. Today, the peace of our nation’s capital was shattered by an act of hatred and brutality. A cowardly act, designed to strike at the very heart of our democracy— at the heart of who we are. But I stand here tonight in solidarity— side-by-side with my colleagues, with our Prime Minister and with all Canadians. This attack struck with sudden and deadly violence. It was carried out on the very ground where we come together to exchange ideas with the knowledge that whatever our differences we will always resolve them peacefully. It was intended to make us more fearful of our neighbours and less confident in ourselves. Today’s events have instead only succeeded in drawing us closer, in making us stronger. To the brave women and men of law enforcement, our security services and our Canadian Forces: Your determination, your professionalism and indeed your heroism today will not soon be forgotten. Just as we have all borne witness to these horrific acts, we have watched in awe your acts of courage— now an abiding emblem of Canadian strength, values and valour. The thoughts and prayers of everyone here in our nation’s capital are with the family and loved ones of Corporal Nathan Cirillo — the Canadian Forces member from Hamilton, Ontario who lost his life this morning, the second in just a few days. Corporal Cirillo was literally standing on guard at a monument dedicated to the sacrifice of others who came before him. To his family and friends, I tell you that 34 million Canadians— at home and abroad, from coast-to-coast-to-coast and around the world— stand with you tonight. In this moment, Canadians are united in grief, and stricken with disbelief. Canada is shaken today, but we shall not waver. We woke up this morning in a country blessed by love, diversity and peace, and tomorrow we will do the same. These acts were driven by hatred, but also designed to drive us to hate. We will stand up, and we will stand together. We will persevere, and we will prevail. Prime Minister Stephen Harper addresses the nation from Ottawa, Wednesday, Oct. 22, 2014. 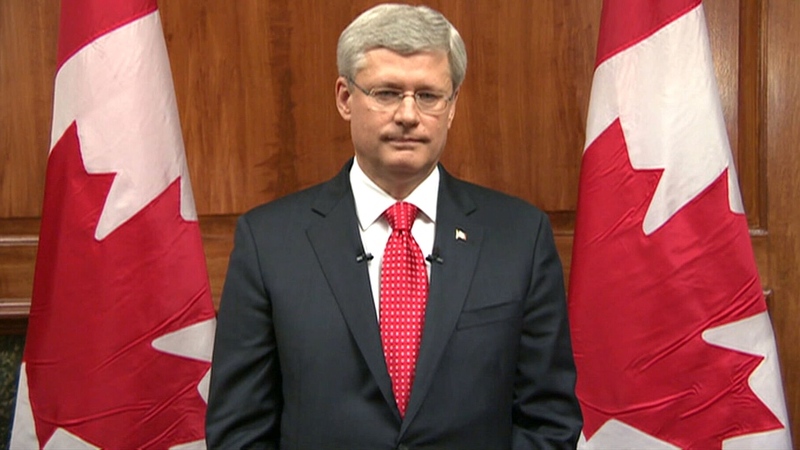 “Canada is not immune to the types of terrorist attacks we have seen elsewhere around the world,” Harper said. Canadian Political Headlines October 22, 2014: Michael Zehaf-Bibeau, slain Ottawa shooter, had criminal record in Quebec, B.C. Our belief is that people who are using violence to undermine democracy want us to be silenced and we refuse to be silenced. Having said that, we all have to be very careful, we have to be vigilant and the authorities are very aware of the situation… But we will carry on with the business of this house and the business of our democratic society.